I was cycling with my son out through the lanes of the Deben peninsula. We had cycled about fifteen miles, with some six still to go, and quite frankly he was ready for a rest. I wanted to visit Falkenham church, and this is near the end of a lane leading from the nearby village of Kirton, and so I left him sitting on the verge at the quiet crossroads, eating an apple and getting his breath back, while I cycled on. 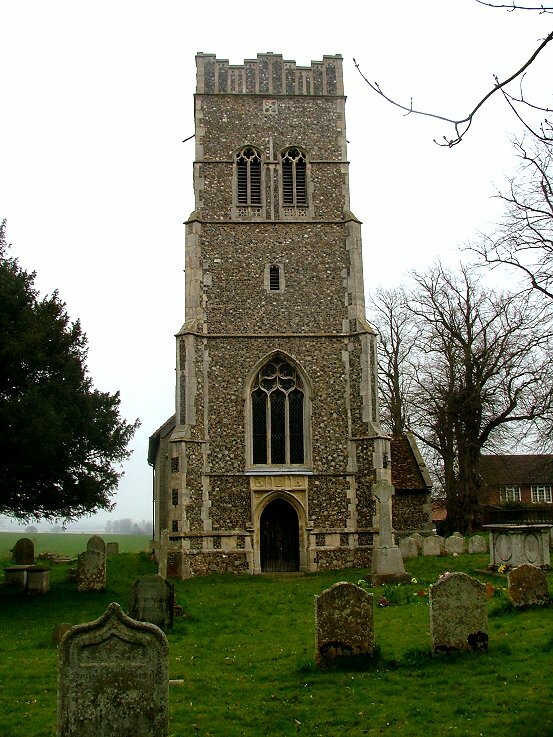 The tower of St Ethelbert appeared occasionally over the roof tops ahead, but disappeared as I came closer, screened as the church is by large trees and the old houses of the village street. It was some five years since I had been here, but nothing at all seemed to have changed. 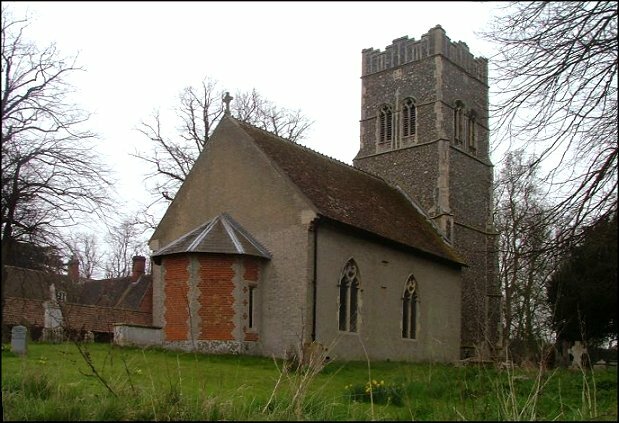 This church, which, apart from its tower, is mainly early 19th century in appearance, has a delectable setting at the end of the village. The tower is splendid, and dates from the early 15th century. 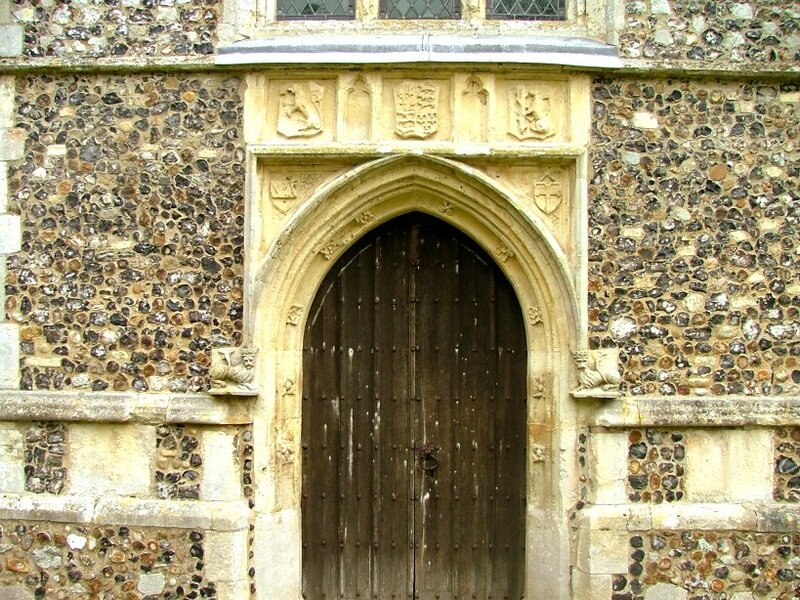 There is a spectacular array of shields above the west door, for those of you who like that kind of thing. The centre shield shows the arms of England, which Mortlock identifies as those first used in 1405. The west window is Victorian, but the bell windows are original. The nave and chancel were in a very bad state of repair after the trauma of the Reformation, and in the early 19th century the remains of the chancel were swept away. 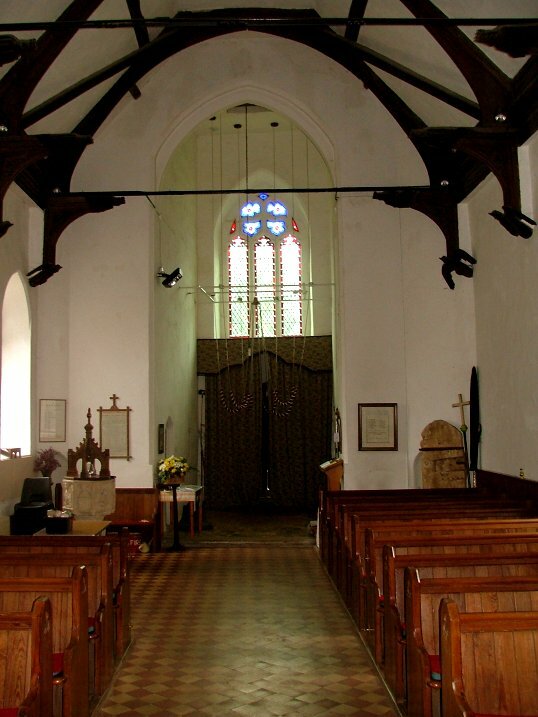 The nave was encased in brick which has since been rendered. 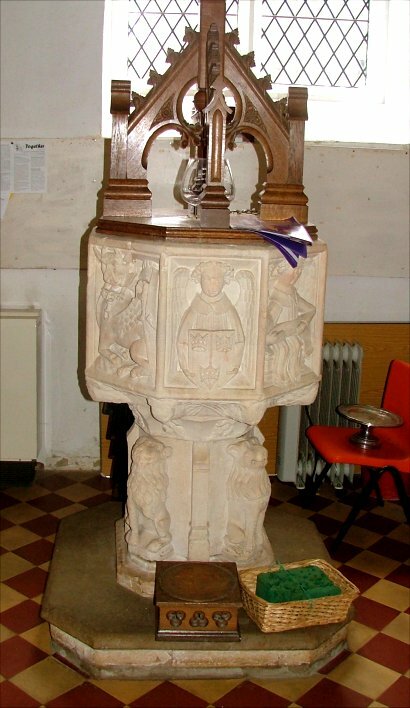 A peculiar apse was built at the east end, looking odder without than from within. Another unusual feature is the stairway that leads from within the tower arch to what must have been a gallery. 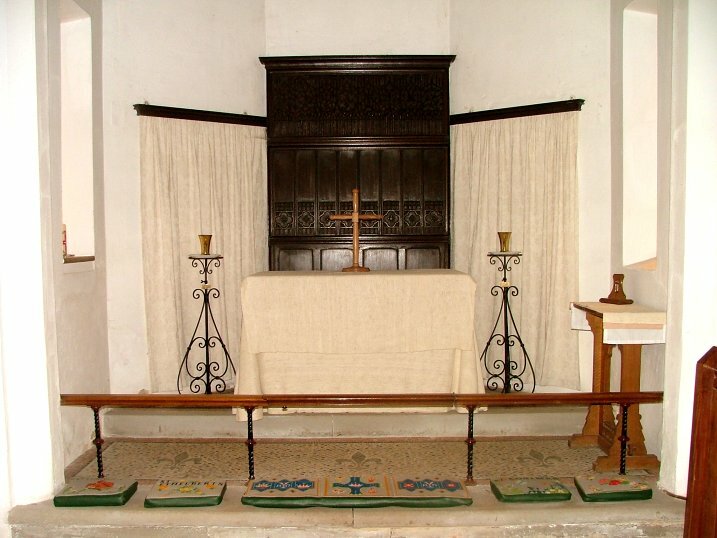 The interior is that of an early Victorian church. The wide nave has a medieval hammerbeam roof, and the reredos is probably Flemish; part of it comes from an ancient chest. 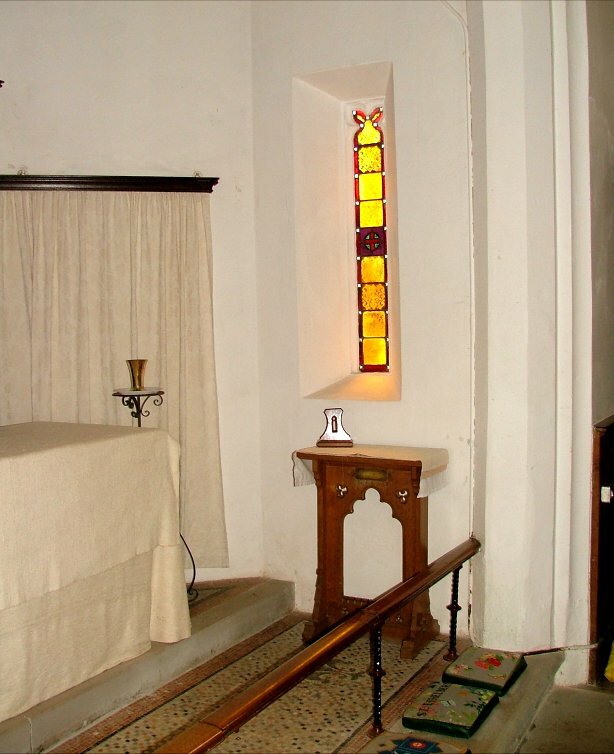 I liked very much the way that the narrow lancets of 19th century coloured glass on either side of the sanctuary filled it with glowing light, an almost theatrical effect. 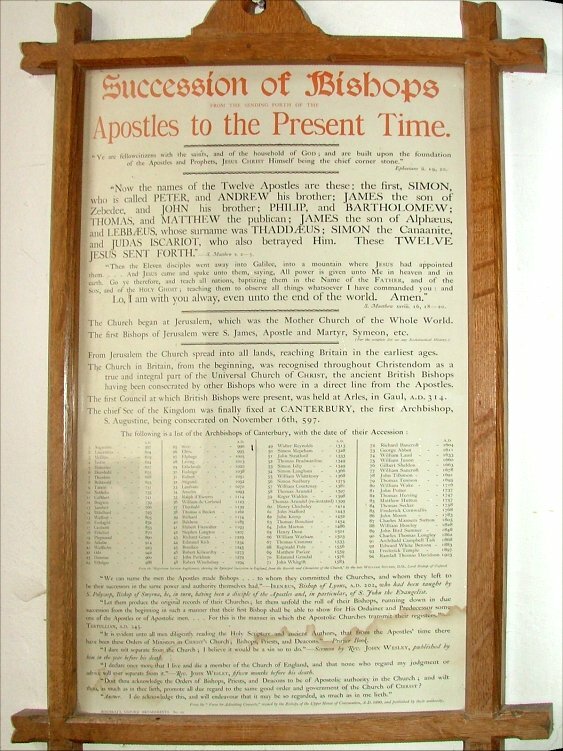 A curiosity, and once a much more common sight, is the table proclaiming the Succession of Bishops from the Apostles to the Present Time, a period piece of early 20th century Anglican propaganda intended to convince the reader of the Catholicity of the Church of England. At one time, this was a topic of some controversy, eagerly debated. All in all, this is a curious building, rather lovely if not particularly dramatic or outstandingly interesting. 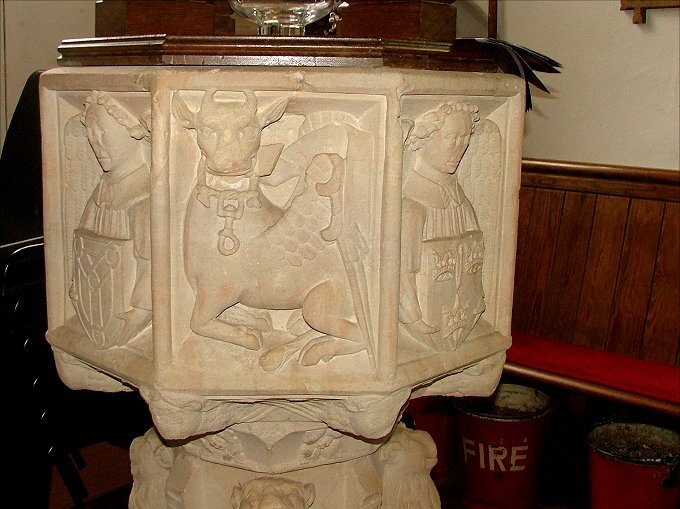 It is a reminder that every Suffolk church is different, but that some are more different than others. 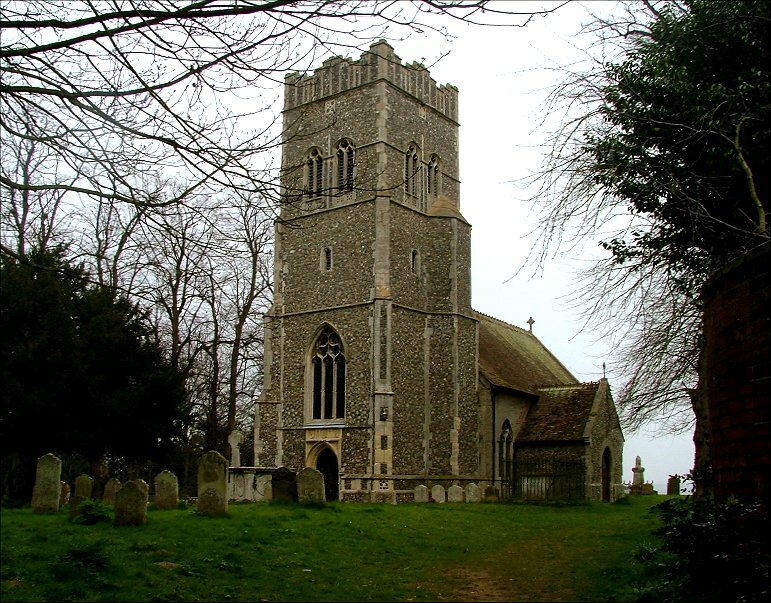 From the map, it appears that it should be a remote church, set as it is down a narrow lane towards the Deben estuary, like nearby Hemley. In fact, Falkenham and the bigger Kirton straggle into each other, and they are almost outer-Felixstowe suburbia. Only a few fields and the A14 separate them from the large housing estates of Trimley and Walton. But you leave that all behind when you enter the churchyard of St Ethelbert, into the shadows of the large lime trees and Victorian houses. And beyond the church, beyond the village, there is a view across the Deben estuary to Ramsholt on the far shore, several miles away, the pub and the church and the marshes between, and the low hills beyond. It is one of the loveliest views I know in Suffolk.